Material sticking in the mold can be a production killer, whether it is the sprue or the formed part of the cavity. The root causes of such sticking can be traced to one of several types of equipment or injection molding process issues. 1）Rough mold cavity surface. If surface defects, such as grooves, nicks, cuts and/or dents exist in the mold cavity/runner, the molded parts tend to stick in the mold, leading to release failure. As a result, one of the main tasks is to improve the degree of the polish for the mold cavity and runner. 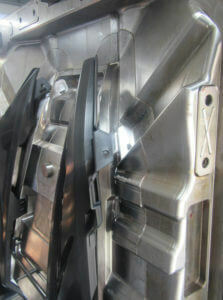 It is better than the inner surface of the mold cavity is chrome plated. Also, in the polishing process, the movement direction of polishing tools should be aligned with the direction of the melt flow. When melt flow flash occurs at the scraped mold parts or in the insert gap, this will also cause release failure. To solve this problem, it is suggested that the scrapes are fixed, and the insert gap reduced. 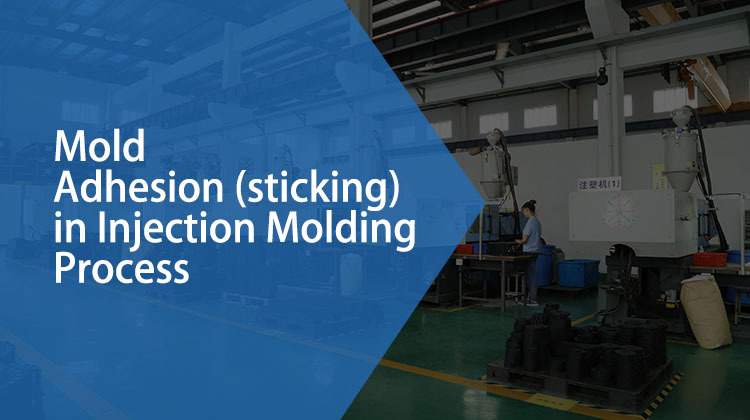 If the mold refuses to open in the very early stage of injection, it means the mold is experiencing deformation under the effect of injection pressure due to insufficient rigidity. And, if the deformation exceeds the elastic limits of the mold, it will not be able to return to the original shape for further applications. Even if the deformation is kept within the elastic limits of the mold, the melt flow is cooled and solidified under the extreme conditions in the mold cavity. When the injection pressure is removed and the mold shape is restored, the molded part will be held in position by the resilience force, so the mold still will not open. As a result, when designing a mold, the rigidity and strength must be guaranteed. During a plastic injection mold test, it is better to install a dial gauge onto the mold, so as to check whether the mold cavity and mold frame will deform during the feeding process. Start with a relatively low injection pressure, and then observe the amount of deformation while gradually increasing the injection pressure, to keep the amount of deformation within a certain range. When a mold cannot open due to a too great resilience force, increasing mold opening force alone is not a solution, but the mold should be disassembled immediately and then take the molded part out after heating and softening. For molds with insufficient rigidity, a frame may be attached on the outside to improve the rigidity. When designing and manufacturing plastic injection molds, a sufficient mold release slope must be guaranteed, or it will not be easy to release the molded parts. If ejected by force, the parts will be warped, leaving cracks or white marks at the force application point. The moveable and fixed platens of the mold must be kept in parallel with each other, or cavity displacement will be caused, leading to poor mold release. All the following situations will cause sticking sprues or parts: the runner is too long or too small, or the connection between the primary runner and the secondary runner are not strong enough, or there is no cold-slug well in the primary runner/bad sprue balance, or the diameter of the primary runner does not match nozzle diameter, or spruce bushing does not mate with the nozzle sphere. Therefore, runner length should be appropriately shortened, and its section area appropriately increased, while strengthening the connection between the primary runner and the secondary runner and setting a cold-slug well in the primary runner. When determining the location of the sprue, we can add more auxiliary sprues to balance the feeding efficiency of a multi-cavity mold and at the same time reduce the pressure in the cavities. Usually, the small end of the primary runner should be 0.5 – 1mm larger than the nozzle diameter, and the concave sprue bushing should be 1- 2mm (radius) larger than the nozzle sphere. If the ejector mechanism is designed with insufficient travel, imbalanced ejecting force or unsatisfactory ejector plate movement, sticking sprues or parts will be caused. When allowed, the ejection area of the ejector pin should be maximized, so as to guarantee a sufficient ejecting travel, while the ejection speed of the molded parts should be kept in a proper scope, neither too fast nor too slow. Unsatisfactory ejector plate movement is mainly caused by stickiness among different sliding components. For example, when the ejector plate pushes to move the sliding core since there is no cooling mechanism in the sliding core, the temperature here is higher than other cores. During continuous operation, the gap between the column itself and the sliding core is too small, so the stickiness thus caused will not allow for desirable core pulling movements. Another example is that if the ejector pinhole is not in good parallel with the guide pin of the ejector plate, or the ejector pin is curved, ejector plate will not move in a desirable manner. If a retaining pin is not set in the ejector mechanism, when foreign materials appear between the ejector plate and the mounting plate, the ejector plate will incline, causing unsatisfactory ejector plate movement. For a large-size mold, if there is only one ejector pin, the ejector plate will not be able to push in a balanced way, which will also result in unsatisfactory movements. 7）Unsmooth mold ventilation or no air inlet in the mold core will also cause sticking sprues or parts, so mold ventilation should be improved, and equip the mold core with air inlets. If it is hard to release the molded parts at the molding joint, we can appropriately increase mold temperature and shorten cooling time. If it is hard to release the molded parts from the cavity surface, we can appropriately lower mold temperature and increase cooling time. In addition, a too high temperature of the fixed mold will also cause sticking sprues or parts. Die adhesion will occur if the mold cavity features a soft porous material. For this situation, hard steel or surface electroplating should be applied. Situations like indentation below the mold joint, and cavity edge line exceeding sprue line will all affect parts release to some extent. As a result, we need to pay attention to it and make a certain adjustment. If the injection molding machine is too large in size, with a high-speed screw, great injection pressure and very long injection & pressure holding time, overfill will be caused, making molding shrinkage smaller than expected, thus leading to sticking sprues or parts. If the temperature of the barrel and the melt flow is too high and the injection pressure is too great, the hot melt flow will probably get into the gaps between mold inserts to cause flash, and subsequently sticking sprues or parts. In addition, sticking sprues or parts will also be caused by low nozzle temperature, short cooling time and interrupted feeding. As a result, when solving die adhesion, or sticking sprues or parts problems, we need to appropriately reduce injection pressure, shorten injection time, lower barrel & melt flow temperature, increase cooling time and prevent interrupted feeding, etc. If the raw materials are mixed with impurities during the packing and transportation process, or raw materials of different grades are mixed during the pre-drying and pre-heating process, or foreign materials get into the barrel and/or hopper, sticking sprues or parts will also occur. In addition, uneven or too large material granules affect die adhesion, too. As a result, the materials for injection molding should be carefully screened and purified. The purpose of applying the mold release agent is to reduce the adhesive force between the surfaces of the molded part and the mold cavity, so as to prevent them from stick to each other, thus shortening the injection molding cycle and improving the surface finishing of the molded parts. However, the effect of the mold release agent is influenced by both the chemical action and the physical conditions. Also, the injection molding raw materials and their processing conditions vary a lot, so the right mold release agent selection and dosage are subject to specific cases. If improperly applied, satisfactory mold release result will not be achieved. With regard to injection molding temperature, the effective working temperature for the release agents containing fatty acids is usually below 150°C, so it is not suitable for high-temperature injection molding. The working temperature for the silicone-based or the metallic soap formed release agents are usually between 150°C and 250°C. The working temperature for the PTEF release agents is as high as 260°C and above, thus known as the best mold release agent for high-temperature injection molding. With regard to varieties of raw materials, it is harder to release a soft polymer part than releasing a hard polymer part. With regard to application methods, release agent pastes are brushed, and release agent sprays are applied using spraying devices. Due to the fact that it is not easy to form an even and regular agent layer when using the paste, so the released parts will have a wavy surface, the sprays should be used whenever applicable. If the injection pressure is too high, the molding shrinkage will be smaller than expected, making it hard to release the molded part. At this time, we can facilitate release by reducing injection pressure, shortening injection time and lowering melt flow & mold temperatures. In such circumstances, the mold release agent that reduces the friction between the part and the mold will be the most effective. As for molds, the most effective methods would be improving the degree of polish, eliminating the bumps on the sidewall, grinding and increasing the number of ejector pins. When molding a deep part, it will be easier to release the part if you blow compressed air between the part and the mold (please refer to the overfilling in “crazing, cracks, fissures and white marks”). There are 2 reasons for this – the nozzle is stuck to the cavity at some point, or the release resistance of cavity side is larger than that of the Core side, so the part sticks to the cavity. The circumstances in which the part sticks in the cavity due to the resistance between the nozzle and the cavity include: The nozzle radius R is greater than the corresponding corner radius R in the mold, so when fixing the mold, the nozzle and the mold are not concentric, or there are plastics leaking from between the nozzle and the mold. Either of the cases will cause the part to stick in cavity side. To prevent this from happening, the mold should be installed properly. The release resistance of cavity side is too high because the degree of polish is too low or there are bumps on the sidewall. At this time, a Z-shaped pulling rod should be installed at the core side, so as to pull the molded part. Therefore, during mold design, sufficient consideration should be made to keep this from happening. It works even though there is a temperature difference between cavity side and the core side. （1） Cooling time is too short, so the main runner is not solidified yet. （2） Insufficient primary runner slope(draft angle 3 – 5°), mold release slope should be enlarged.